Green Beans with Bacon are a great easy to make side dish that is perfect for most any occasion. 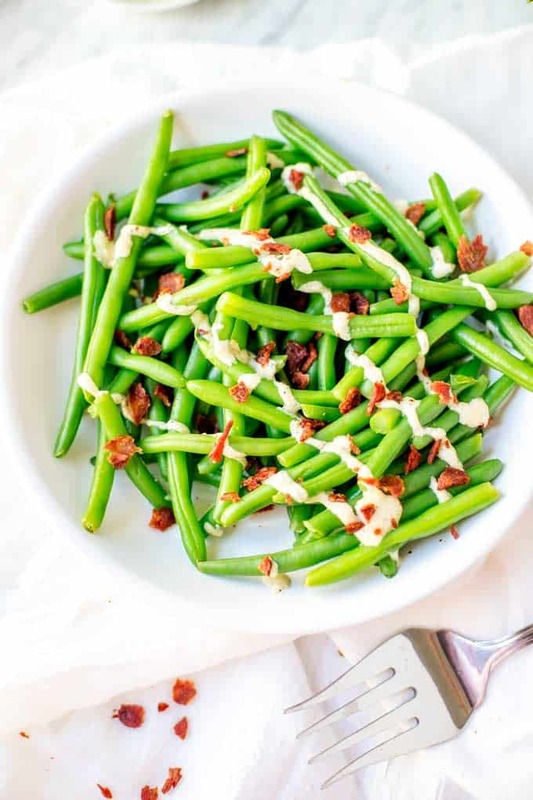 Fresh green beans and bacon are elevated with a delicious garlic tahini sauce. This recipe is so simple that you may find your other green bean recipes with bacon collecting dust! Growing up, my dad always had a garden. One thing that he grew every year was green beans. I can remember watching sports on the weekends with a basket of green beans in my lap. As kids, we were always recruited to help trim and snap the green beans before my mother canned them. At first, it was fun, but as the day went on, I can remember the task growing old. Especially on the years that his garden did particularly well. Nothing against canned green beans, but these days I’ve come to appreciate fresh green beans immensely. Unlike the green beans my Mom canned, these Green Beans with Bacon retain the vibrant color and crisp freshness. I don’t think the texture can be beat. This Green Bean with Bacon Recipe is such a simple side dish that comes together in about 15 minutes. It works just as well on your holiday table – from Easter to Christmas – as it does for Tuesday night. 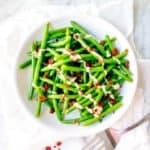 I’ve paired these Green beans with Bacon with a simple lemon tahini sauce that you can easily make ahead. In addition to being fabulous on these green beans, it is also great drizzled on bowls, meat or even mixed with a little more olive oil or lemon juice to create a salad dressing. 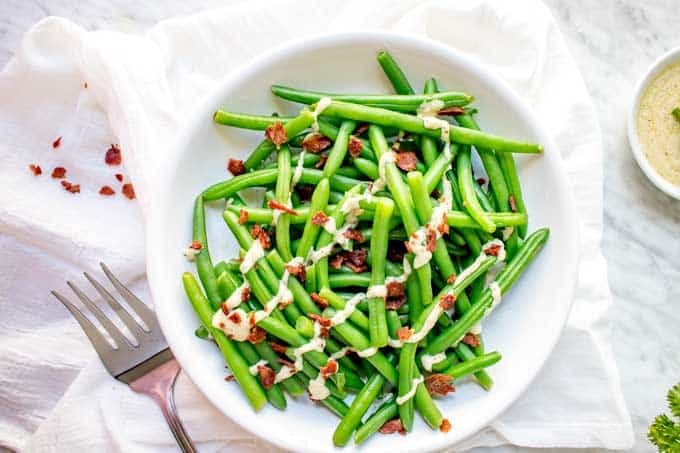 Green Beans with Bacon make a great easy to make side dish that is elevated by a simple garlic tahini sauce. ¼ teaspoon fresh ground black pepper. Bring a pot of salted water to a boil. Add trimmed green beans and boil for 3 to 5 minutes or until crisp-tender. Drain and place in a bowl of ice water. Drain. Meanwhile, whisk together olive oil, tahini, lemon juice, garlic, sea salt and pepper in a small bowl. Drizzle beans with dressing and top with bacon. Serve immediately. Make these Green Beans with Bacon Vegan by using Tempeh Bacon or Coconut Bacon. Save any leftover Tahini Sauce and serve it over a bowl or drizzled on a salad. What a great recipe for fresh green beans. 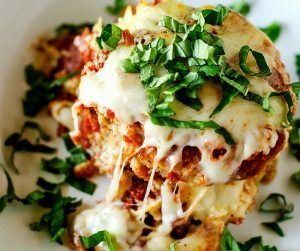 I need to make this for dinner. Green beans is certainly a vegetable we can all agree on at my house. Thanks for a new way to cook them. I look forward to trying this! Green beans with bacon is such a fun combo!! Now I am craving this! 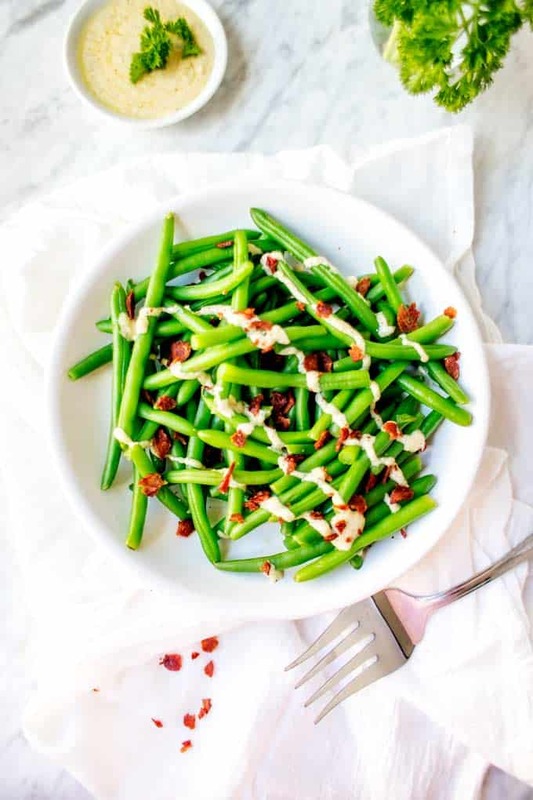 Green beans with bacon is one of our favorite week night side meals! Bacon improves just about everything, doesn’t it? I looove green beans with bacon. We’ve found doctoring up our veggies makes them a lot more appealing to our kiddos. I always enjoyed the fresh green beans and even yellow beans when I was a kid at my grandparent’s house. Your recipe sounds so easy to make, I will have to have my husband try this as he loves green beans and bacon. I make green beans a few times a month my family loves them. I do like recipe with bacon sounds really good. Yum! The pictures really make them look even more delectable if that is possible. I know my boys would enjoy their green beans if I added bacon. you had me at bacon, this looks amazing. 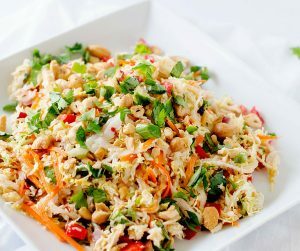 i will have to make this later. I make green beans with ground beef this way. I haven’t tried it with bacon but it surely looks and sound better with it…thanks for sharing.